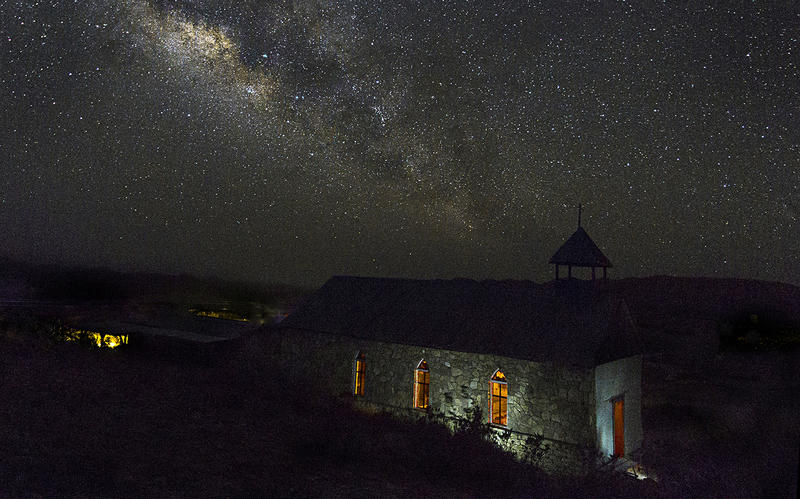 Terlingua ghost town church under the Milky Way. If you’re a regular visitor to this blog, you may remember that last summer I decided I wanted to learn to do astrophotography, so we set up a tripod in a couple of parks and gave that a go. It worked out pretty well for a first effort, but I knew I had a lot to learn, so I signed up for a Milky Way photo workshop near Big Bend National Park. 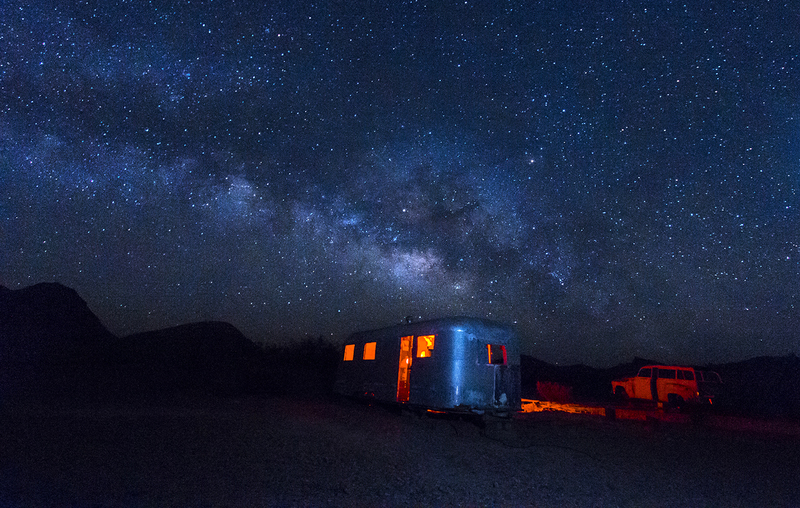 Big Bend has been designated an International Dark Sky Park, so it was a great location for improving my skills. If you are serious about improving your photography, I definitely recommend looking into workshops! Getting tips about camera settings was very helpful for me. The instructor suggested I shoot at ISO 6400 with an exposure of 20 seconds. This was a shorter exposure than I was using the last time, and it made a big difference in the clarity of the stars, which start to show movement in longer exposures. He also used flashlights to “paint” objects in the dark, but again it was for a much shorter time than we’d tried before. For example, the trailer was lit with a red flashlight from inside, but the outside was lit with just one flash of a strobe on its least powerful setting. The church was lit from the outside with just a flashlight for 1-2 seconds. We also spent a couple of hours during the workshop going through the instructor’s workflow to process a photo in Photoshop. I learned great Photoshop tips and how to use different tools that will help if I do more Milky Way photos but also which will work with other kinds of photography. The instructor made his workflow available in a video series, so I have that to refer back to since I probably won’t be doing it that often. Not all instructors would do this, but it is really nice to have that to refer back to as I learn a new workflow. Obviously we did all this shooting at night – we went from location to location between 9:00-11:00 PM and then from about 1:30 AM until 5:30 AM, so if you’re planning to do something like this during a trip like we did, keep in mind it will impact what you’re able to do during the day (mostly sleep!). Also, if you’re going to do something like this on your own, you’ll want to scout the location carefully before it’s dark and pay attention to things like where the Milky Way rises, when it rises, and what phase the moon is in. Below are some photos from a couple of other participants in the workshop. I love these other photos, which were both scenes I didn’t shoot. I’m definitely going to try a tent photo sometime! I hope you enjoyed all of our work! Have you had any great night sky photography adventures? Share them in the comments below. And enjoy your next photography adventure, whether it’s during a week or a weekend. FB – I just did a photo workshop at the Coast. It was the best three days of creativity. I too would highly recommend a workshop if you are looking for new skills or even new creative inspiration. Hello Erin, great shots of the milky way! I hope to travel to Big Bend later this year to photography the Milky Way too, I was wondering what aperture your camera was set at for the ” ISO 6400 with an exposure of 20 seconds” shot? Thanks!